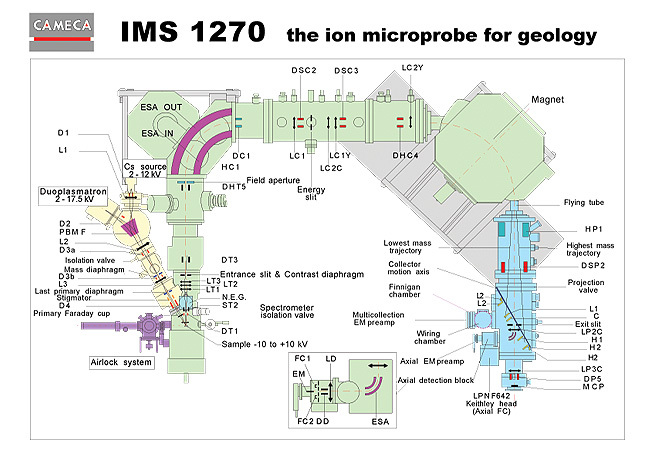 Synopsis of the UCLA ims 1270 showing the layout and location of many of the ion optics. The UCLA ims 1270 uses both the standard CAMECA Cs+ (microbeam) and duoplasmatron (16O-) primary ion sources. While either source is capable of producing ion beams as small as 1 µm diameter, most isotopic analyses utilize beam diameters in the 10 to 30 µm range to quickly achieve desired precision. Like the SHRIMP ion probe, the 1270 routinely attains a mass resolving power (MRP) of up to 5,000 without significant loss of secondary ion intensity; this is necessary for isotopic analysis of certain trace elements at high sensitivity (e.g., Pb in a zircon). Dynamic mass range is 300 (H to UO2). Like the smaller CAMECA instruments, the 1270 also functions as an ion microscope by direct ion imaging of the sample (with ~0.5 µm lateral resolution), which is a key component for achieving good (~nm scale) spatial resolution during depth-profiling (because it enables elimination of crater edge contributions). For the analysis of negative secondary ions from electrically insulating samples (e.g., O isotope measurements in silicates or carbonates), a normal incidence electron flood gun provides charge compensation. This is the only method that has been demonstrated to work routinely for high-precision oxygen isotope measurements. A five moveable collector ion detection system is operational for several types of isotopic analyses. In some favorable cases, precision of isotopic ratios achieved in multicollector mode is comparable to that typical of other traditional high-precision mass spectrometric methods although with SIMS the spatial information regarding complex isotopic distributions in a sample is preserved. The multicollector enables new types of scientific investigations, and has been increasingly utilized by visitors to the facility, particularly for investigations of C, O, and S isotopes.